Researchers at the University of Iowa recently reported the results of the largest study to date on the relationship between exposure to endotoxin and incidences of wheeze and asthma in children and adults. The study was a collaboration with researchers at the National Institute of Environmental Health Sciences and the National Center for Health Statistics. Endotoxins are immune-modulating molecules found in the outer membrane of common bacteria that elicit inflammation in the airways of animals and humans. 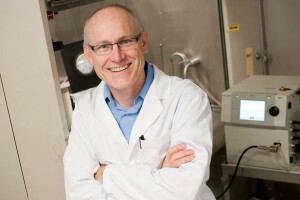 According to research team leader Peter Thorne, professor and head of occupational and environmental health at the University of Iowa College of Public Health, the study showed that higher levels of endotoxin in dust samples were positively associated with an increased prevalence of active wheezing requiring medication and health care utilization. It was noteworthy that the relationship between endotoxin and wheezing did not exhibit a threshold, but showed a positive association over the entire range of values measured. Thorne’s group tested endotoxin in bed and bedroom floor dust samples from almost 7,000 U.S. households using a novel approach that included unprecedented quality control measures. The participants were enrolled in the National Health and Nutritional Examination Survey (NHANES). According to Thorne, endotoxin was found at higher concentrations in lower-income households and in households with carpet, children, pets, vermin, and smokers. Results of the study were published in the December 2015 edition of the American Journal of Respiratory and Critical Care Medicine with an accompanying editorial. The full article is available here: http://www.atsjournals.org/doi/10.1164/rccm.201502-0251OC#.Vm8V5kZF0w8.